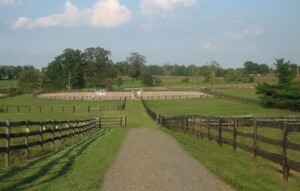 Forecast Farms Inc. is a small family owned equestrian facility located in scenic Fauquier County, Virginia hunt country. 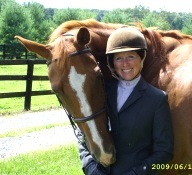 We offer private and group English riding lessons for beginner thru advanced levels, ages 4 – adult. You can choose to take lessons on our own horses, or bring your own horse. Ship-ins are welcome. Year-round riding is available in our indoor riding arena. Our year-round hunt seat lesson program features private and semi-private lessons on safe show-quality horses and ponies, which enable students to progress quickly and experience success in mastering new skills. Our emphasis here is safety first, then on horse and rider development. With our focused instruction and horse show experience, we can help you make the most of your next ride. Denise Finch is a true professional who believes a rider should know their horse from the ground up. She fosters a relationship between the horse and the rider so they, as a team, can demonstrate the best of their abilities together. She is encouraging and knowledgeable in her instruction and focuses on the needs and personal goals of her clients as a foundation for training. Through her instruction and direction, I have been able to progress in my riding so that I feel confident and educated when I ride. This has allowed me to achieve more goals in riding than I ever thought I was capable. Forecast Farms Inc provided me with a newfound confidence in riding. Denise taught me how to become a safe and effective rider instead of a passenger. Each lesson provided me with exercises to help strenghten my mind, my body, and most importantly, the balance between horse and rider. Not only did Denise provide me with excellent training but she also took the time to teach me proper horsemanship and general farm management. Thank you for everything Denise! Leesburg, Loudoun County, Marshall, Middleburg, Rectortown, Upperville, New Baltimore, Rappahannock County, Virginia.